And Yes, I Do Carry Tranq Darts Around, Just In Case of Socially Awkward Situations. also kind of an appalling caricature of Asian people. A character who uses a knife & fork like chopsticks. A character for whom, every time he enters a scene, a gong sounds. Put him in a choke-hold until he’s unconscious. Run. Run and keep running and don’t stop until you’re in another state and you can send the divorce papers via Fed Ex. To me, the idea of approaching this man is incomprehensible. I’ve written a little bit before on a similar issue (see here), but, given the potentially racist faux pas involved, the cost/benefit analysis? Forget it. There’s simply no way you think that’s a good idea. And if you’re with the person doing it? Good lord. Break out the tranq darts. One for your friend, one for yourself just to get out of the situation. You know, I was also on a little show called ER, jerk. So, you ready for the twist ending? It was him. 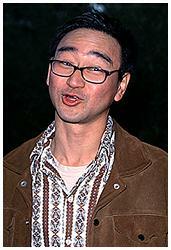 It was Gedde Watanabe. Are you kidding me? Well, so, okay, on one hand, bullet dodged, right? But the thing is, forgetting the gamblers odds in that situation, it’s still a bad move. 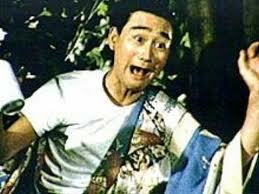 “Say, aren’t you the actor whose been in literally dozens of films and TV series, many of them classics, but who will forever be remembered as naively doing the Asian equivalent of a shuck ‘n jive minstrel show? That’s you, right? The Donger? It is! Ha ha! ‘No more yanky my wanky!’ I knew it!” That’s got to be rough for Watanabe, no matter how nice of a guy he supposedly is. So if, really, “Just leave the guy alone” isn’t an option, maybe at least go with option #4: Take an extra 30 seconds and think of something else he was in. * No one ever dies in Disneyland because if they do die, the body is taken off the property before an examiner declares them legally dead. This is true. ← I Wrote The Most Interesting Blog Post… And You Were In It! Today with smartphones you could probably do a quick IMDB search and find out something else more legit. This is the story of my freakin’ life! I don’t know how I managed to be born into a family filled with people willing to say anything, any time to anyone while I’m cowering in a corner somewhere just wishing the earth would open up and swallow me. Pass me a tranq dart please. Is the whole bit about people not being allowed to “technically” die in Disneyland really true?? EIther way, great story! Supposedly that includes someone who was decapitated, but I think that’s urban legend. Otherwise, yeah. No one (officially) dies in Disneyland. Another fun read with you! You mix humor with travel/human interest/culture and it always turns out to be one of the best reads of my week. Keep the darts in their special pouch but carry them w/you… just in case. And I’ll have to get a specialized tranq-dart pouch. Maybe get it monogramed.